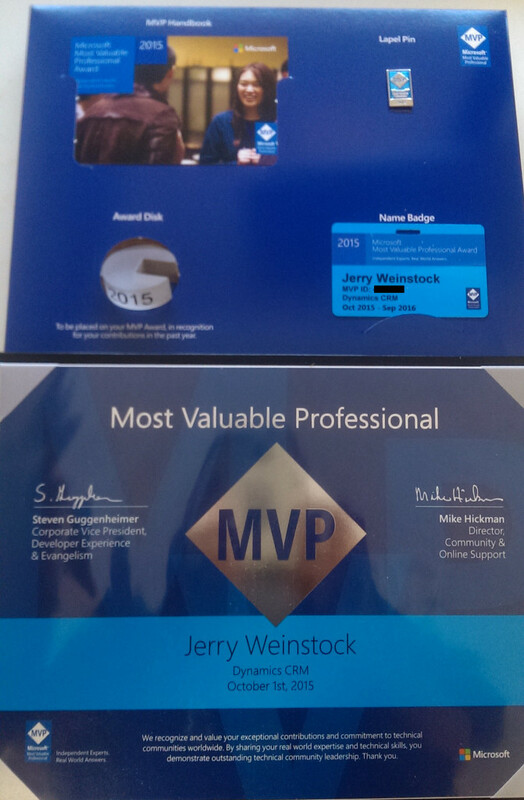 Today I received my CRM MVP award packet. Next to running a successful professional services firm and meeting payroll for our valued team members twice a month, it is my proudest professional accomplishment. It’s my 6th year as an MVP. This year I gave back to the community by being a member of the CRMUG Board of Advisors, helping to organize the CRMUG Summit, contributing to the support forums, co-authoring a CRM book and interacting with the product team to name a few areas. I expect to be a contributor again this year helping the community and envangelizing the product so I can be awarded for 2016. What’s the best perk of being a CRM MVP? Hanging out with 60+ other CRM MVPs from around the world each November locked in a room on the Microsoft Campus with the great people from the product team! The award packet includes the instruction booklet (hey it’s the software business), spiffy lapel pin, the award disk ring, name badge, and the wall plaque. Not shown is the secret decoder ring which automatically solves all CRM problems and writes 100% correct code. Just kidding, but keep on wishing!